Just over two ounces in weight, this light, short cut features razor-like tapering of barely waved layers. Ready to wear with a firm shake right out of the box, this asymmetrical boy cut is as easy to style as it is comfortable to wear! Link to Wigsalon.com and Cinch from Raquel !! Costume Wigs and Costumes up for Halloween ! Strating at under $20, most of WigSalon's costume wigs ship on the same or next business day as standard! It's no wonder consumers prefer our fast friendly service to searching for wigs in a local costume shop. We have everything you could want right here and at super low prices. Due to the nature of costume parties, costume wig sales are final. For questions on costume wigs, please contact: mike@wigsalon.com TO VIEW HALLOWEEN UPS DELIVERY MAP - CLICK HERE. Click to View Our Party Selection ! 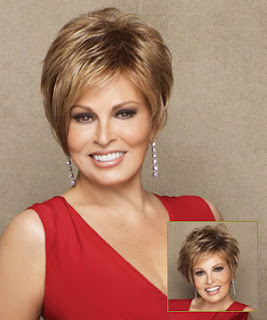 World renown model, actress, and mom - Kathy Ireland has teamed up with Jon Renau's design team, to create 5 new wig styles for 2010. WigSalon finds these styles to excel above other brands in their super light construction and comfy fit. Long full wigs at 3.8 oz. were just unheard of until now. They start as low as $99 with the VIP Coupon, which should always be used these days! WigSalon's new bi-coastal shipping logistics means guaranteed faster wig shipping no matter where you live. And our world-famous everyday low price wig values can't be beat. Kathy Ireland wigs routinely ship out next day via 2-day airmail. Freshen your look for Fall with something new for you!